Publisher, playwright, prose writer, social critic and poet, T.S. 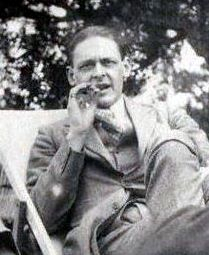 Eliot was an American born writer that emigrated to England when he was 25. Ezra Pound encouraged Eliot's writing, along with other up-and-coming authors such as James Joyce and Robert Frost. Eliot was awarded the Nobel Prize for Literature in 1948. His popular poem about an extremely insecure man, The Love Song of J. Alfred Prufrock is often studied in high school grades 11-12.